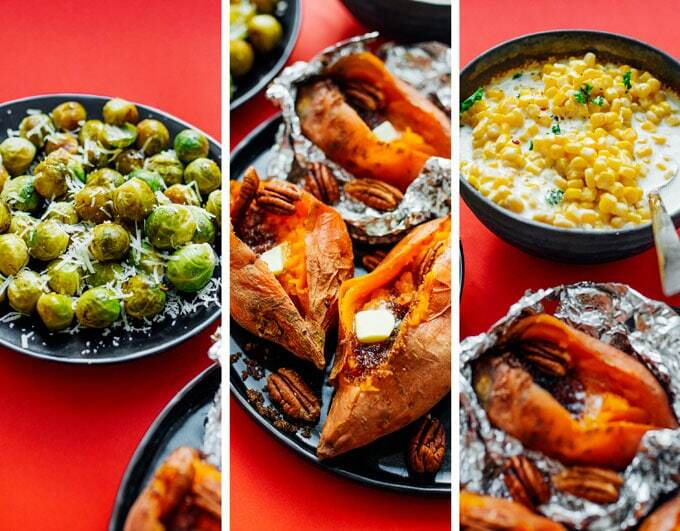 Today we’re whipping up not 1, not 2, but 3 slow cooker Thanksgiving side dishes! 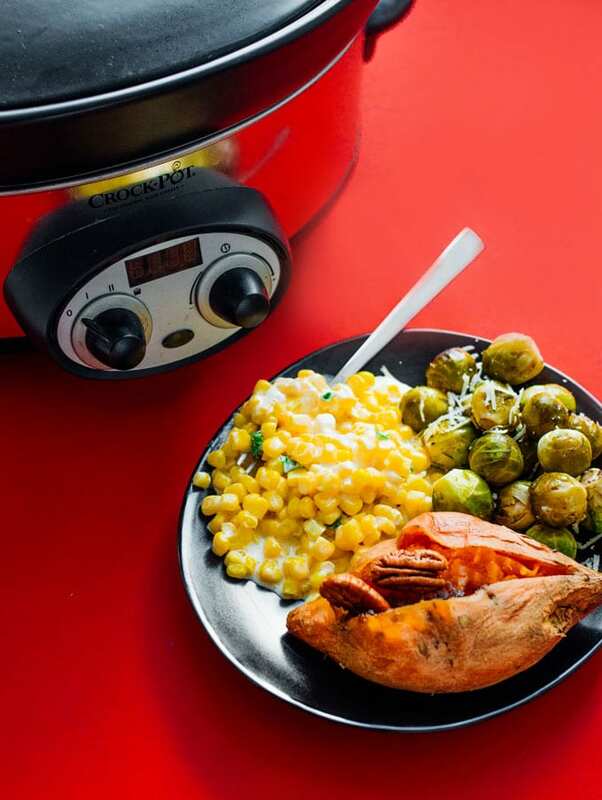 Creamy corn, parmesan Brussels sprouts, and brown sugar sweet potatoes all stuffed into the same slow cooker and ready in 3 hours. Last year was my first time ever hosting and making a Thanksgiving feast. And being the type A person that I am, I obviously planned out a 48 hour schedule leading up to the feast to make sure every recipe would be ready. While it all turned out great, I was frazzled as frick. Red cheeks and frizzy hair, frantically scurrying around to get everything on the table in time. So this year I’m bringing in some hands-off recipes that will cook themselves so that I can focus on hosting! So here’s the plan. You’ll wrap your potatoes in aluminum foil and throw them in the slow cooker on high for an hour. After that hour, you’ll add in your Brussels sprouts and creamy corn mixture, each in their own little aluminum foil boat. Keep cooking for another 2 hours then serve! That’s seriously it. Let’s do this. Whipping up three vegetable slow cooker Thanksgiving side dishes! These easy side dishes are cooked at the same time and ready in 3 hours. 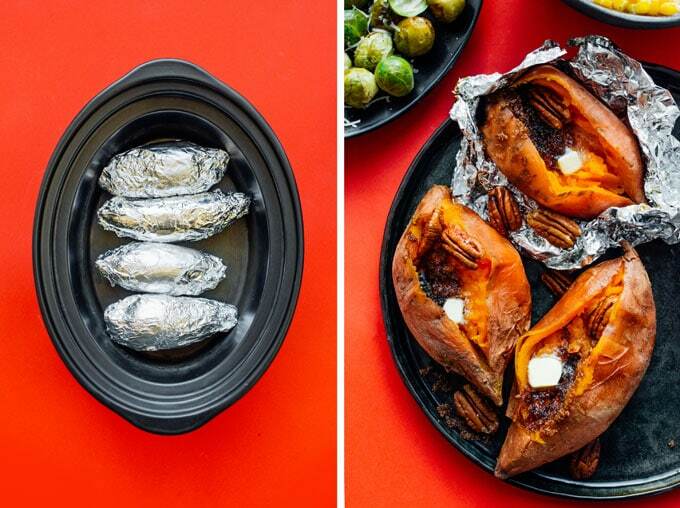 Sweet Potatoes: Wrap potatoes in aluminum foil and set in a slow cooker. Cook on high heat for 1 hour. Brussels Sprouts: Meanwhile, toss together cleaned Brussels sprouts, garlic, oil, salt, and pepper (if your sprouts are large, cut in half). Wrap in aluminum foil to create a pouch. Set aside. Creamy Corn: Stir together all corn ingredients. 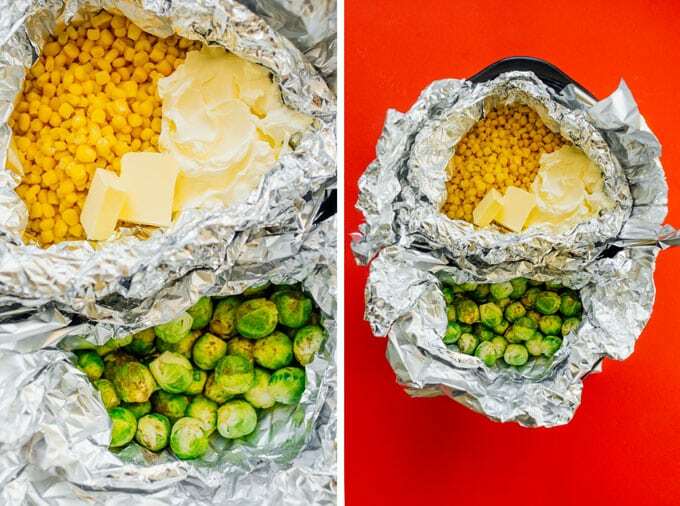 Create an aluminum foil pouch, using a few layers to make it water-tight. Pour corn mixture into foil pouch and scrunch together to seal. Cook: After 1 hour of cooking, flip sweet potatoes then set Brussels sprout and corn pouches on top of potatoes. Cover and continue cooking on high for 2 to 3 hours, or until sprouts and potatoes are tender. Optionally broil sprouts in the oven for a few minutes to crisp up the outsides. 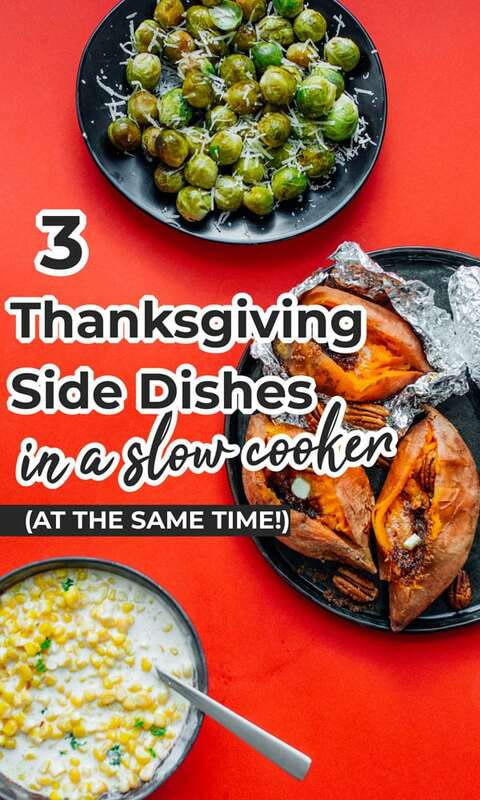 Serve: Keep side dishes warm in the slow cooker until ready to serve. 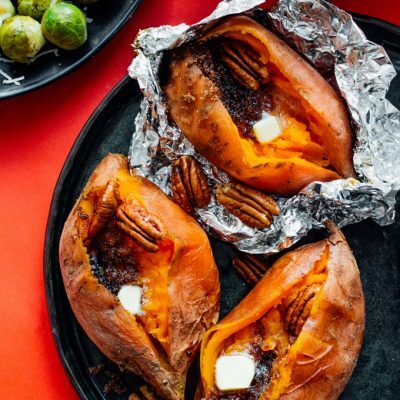 Serve sweet potatoes with a small spoonful of brown sugar, a slab of butter, and pecans. Grate parmesan over warm Brussels sprouts. This post contains affiliate links, which means if you make a purchase after clicking a link I may earn a commission (at no extra cost to you). 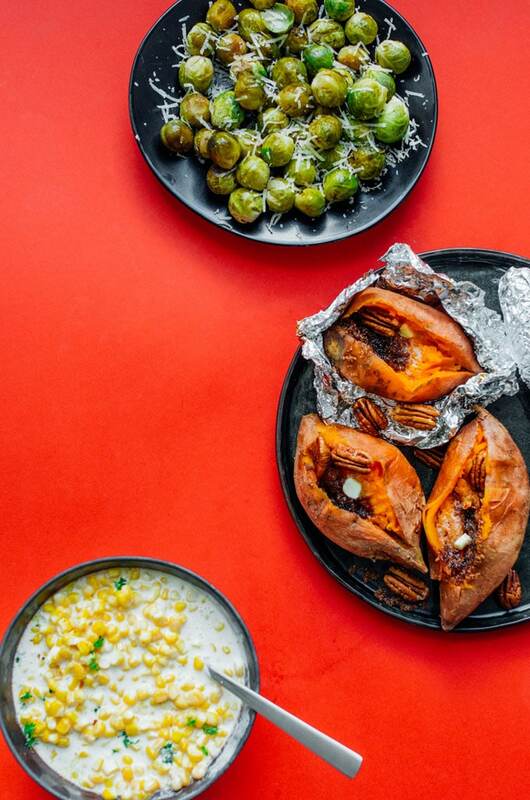 Thanks so much for supporting Live Eat Learn and making easy vegetarian recipes like these slow cooker Thanksgiving side dishes possible!